This is just a brief update to let you know about various things that have popped up on the web, if you missed my incessant tweets and facebook updates over the past few days. 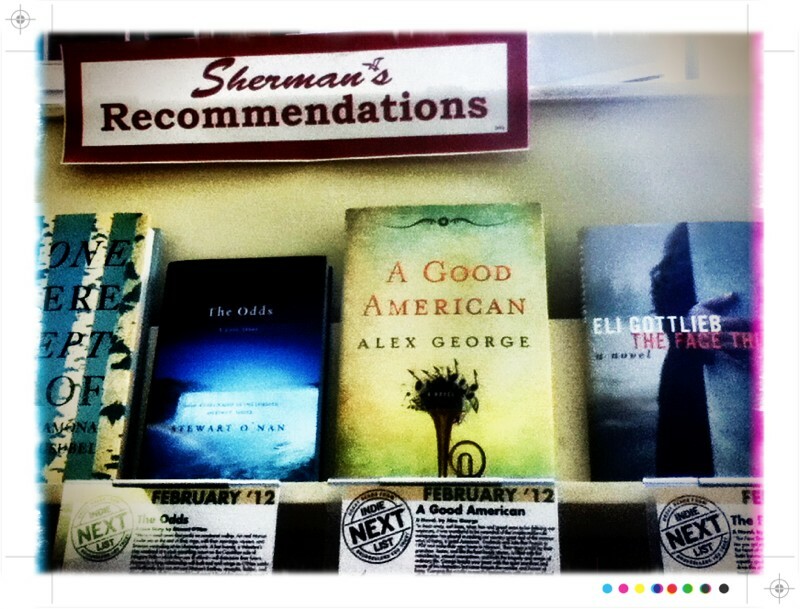 A GOOD AMERICAN was named as one of amazon’s Best Books for February. Here is an interview I did with Nicole from the excellent book blog Linus’s Blanket – I only answered six of the twenty questions she sent me, and everyone should probably be grateful for that. Also, a smart and funny review by Amanda Nelson of the Dead White Guys blog. And this review appeared online yesterday at the Kansas City Star. Not sure when it will appear in the paper edition. Talking of paper editions, Columbia, MO residents be warned: there’ll be an interview with me in the Sunday edition of the Columbia Tribune. And speaking of Columbia residents, if you have nothing better to do next Tuesday, please consider coming to Barnes & Noble at the Mall at 7 p.m. to help me launch A GOOD AMERICAN out into the world. I’ll be giving a small talk about the book and reading an extract. I’d love to see you there, before I set off on my travels later in the week. Not sure how much blogging will get done in the forthcoming days and weeks. I’ll do my best to keep this updated as and when I can. In the meantime, thank you ALL for reading, your comments, and your support. It means the world to me. But of course! Everyone knows Mainers have impeccable taste! Such exciting news, Alex–and yes, the day is nearing–so thrilled for you and your family–and looking forward to continued updates on every step of the adventure! Thank you for taking some time out of your busy schedule to do an interview for The Juggling Writer — I can’t wait to run it Tuesday. And I can’t wait to see how the release goes for you. I know you like Maine, so it’s cool that one of the first sightings of A Good American comes from up there. I love stories that span decades and look forward to finally reading the book next week. I know there are no guarantees, but with the pre-release buzz and you just being very easy to root for, I have to think it will be quite a wonderful (and exhausting) thing. All the best with the release! Alex, I love the interview over on Linus’ s Blanket, brilliant, as you might say. While I’m still reading your beautiful book I’m touched constantly by your word choice and insight into human nature. I can’t wait to be hand selling this book next week at work. I am sure it’s going to touch so many readers.